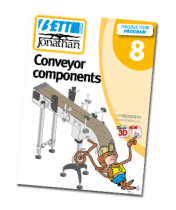 The idea of providing competent and reliable purchasing services focused on conveyor components sprang from the awareness that our 30 years’ experience as designers and manufacturers of conveyor components, supported by our corporate Quality System, is a major resource for selecting and finding conveyor components with an optimalquality/price ratio on the global market. This also means that we do not always have to invest in equipment to start ad hoc productions which might sometimes lead to additional expenses for our customers. Whatever you’re looking for... we’ll find it for you! Trust in Jonathan... and you’ll see how he makes your life easy! Pursuant to Bett Sistemi’s continual improvement policy, the Web edition of the Handbook is continuously reviewed and updated with respect to the printed edition. Complete your product range with respect to the paper edition by downloading the Web novelties. You will be sent the latest updated paper edition free of charge. The product range is completed by downloading the Web novelties.